The supermarket - almost any supermarket - is my happy place. 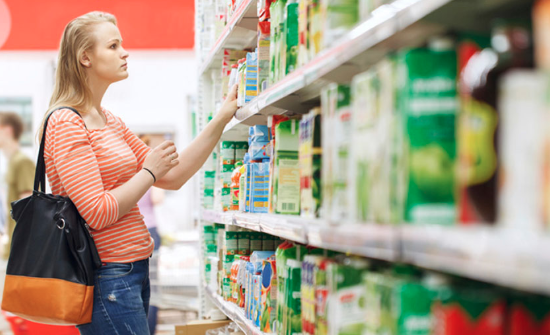 Whether alone, with a client, or accompanied by my daughter who loves to call out “marketing” on various labels (a subject perhaps for another post), strolling the aisles is a favorite past time. And really, what’s not to love, aside from maybe long lines at the cashier or your favorite item being out of stock? We’re blessed with an abundance of choices. Convenience items to make fresh meals come together in minutes. Tropical fruits in the dead of winter. Grains hailing from across the globe. Fresh meat, butchered to our liking, ready to hit the grill. And though the supermarket has changed significantly since the early 1960s, I can’t help but view everything at my fingertips through the same lens of awe as my grandmother did, fresh off the boat from her family farm in Italy, marveling at, among other things, peanut butter. For someone accustomed to grinding her own wheat, something this delicious - and deliciously convenient - was marvelous indeed. Unfortunately, abundance has proliferated into a sea of confusing choices, causing many of us to view the bounty of nutrition with which we are blessed as more of a curse. Labels which carry little meaning (read more here) divide shoppers into opposing camps, promoting both a food elitism and sense of shame. It’s become a popular refrain amongst nutrition professionals and marketers alike: we should be “pro choice” at the supermarket. But when many of these choices are rooted in fear and confusion, it’s difficult to feel good about taking that stance. -Antibiotic-free meat. If your child was sick, would you give him or her medicine he or she needed? Likely so. Sometimes, farmers and ranchers might need to care for a sick animal in a similar capacity. However, that doesn’t mean antibiotics are in your meat. The medication is fully metabolized by the animal and tested by the USDA. All meat sold in the US, therefor, is free of antibiotics. -Milk from cows not treated with rBST or rBGH - notice the * on dairy products making this claim - there is no evidence that milk from cows treated with rBST or rBGH is different than that from cows not treated. Moreover, while this treatment gave dairy farmers the ability to produce more milk (and therefor offering dairy products at lower cost to the consumer), its usage has largely been phased out in the US. -Non-GMO Project verification label - given there are only ten genetically modified crops in the US foodsyste, it’s astounding to see so many products labeled as non-GMO. One, GMOs have been deemed safe by health organizations across the globe, and two, if a product doesn’t contain an ingredient with a genetically modified counterpart, why label it as being non-GMO? Example: pasta. There’s no such thing as GMO wheat, making this label unnecessary. -Organic - purchase organic if you feel there is a difference in flavor or texture. But recognize that “organic” refers to an agricultural method and is not a signifier of superior nutritional quality. Moreover, contrary to popular belief, organic crops can be sprayed with pesticides, sometimes in greater quantity than their conventionally-grown counterparts. The above is an abbreviated list, but hopefully enough to help shift your filter to one of gratitude at the grocer, and to better arm you to make informed choices. Have you ever felt overwhelmed by choice at the supermarket? Let me know in the comments below! Enjoy your food. Enjoy your life!! !